With a lot of long hours on set & down time between set-ups, I found myself checking out profile after profile. not just sitting by waiting for life to happen, for love to cross my path by pure luck, but yet I was numb as I scrolled from one to the next. Knowing I wasn’t quite enjoying the process, a fellow single girlfriend on set joined my search & thought she’d find him for me ~ why not? Outside opinions could be great, right? Maybe she’ll see the diamond in the rough. Well, I got a live one! Sent me message like he was answering a question (which I hadn’t asked) & in my “eh” state, I answered…mistake #1. Responding to his 3rd message, (after ignoring message #2), at midnight on a Friday night while sitting on set AND giving him my #…mistake #2.
Who knows why I was shocked when he kept texting even after I said I was busy & would call later… silly me. & we hadn’t even spoke to each other yet!!!! Oh, & he was sure to send me one. His aggressiveness & eagerness rendered him very unattractive in my book. Men are visual…they want to be sure you’re profile pics are true…whatever the excuse, I was CREEPED out!! So, I deleted my okcupid account & headed towards the greener pastures of the “scientific matching system” of eharmony. Kinda going with the rationale that if they’re willing to pay for a subscription, they must be ready for a real relationship, and if anything else it’s a new audience. The last time I tried eharmony, a lil over 2 years ago, they told me they had no matches for me & to try back later. it did sting a bit to hear there was nobody for me. I’m a new woman…I’m hopeful! And quality matches have been coming in – phew!! I think my meat eating tendencies deterred the Vegan. The Science Professor & I had very little to talk about. And to keep things fresh, friends have been sending potential mates my way too. Who knows you better & wants to see you happy more than your friends, right? The 1st fix-up was fun. A great guy. Made me laugh. Found him very attractive. he wasn’t looking for a relationship. Likes his life how it is. I admire that awareness & candidness up front. The 2nd friend intro/re-connection is quite a cool guy. for a group of men who are working on their dating skills. 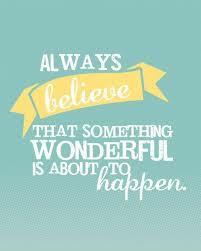 the good mojo is starting to flow again & I have some really good feelings about what’s coming!! Ok, I’m back at it! Always, gotta keep in practice, right? So far, not so good in the response department, soooo I’m going with we’re not a match on all counts. I will admit to getting confused by the guys who do pick you as a “match” via OkCupid’s “Quick Match” system, yet when you get notified that you both chose each other, they don’t make a move. So, I’ll throw a quick lil note out there to said match…nothing. It can all be very confusing. I try to not interpret actions or non-actions, but you gotta wonder sometimes people’s motivations. Best to keep it at screen value ~ what’s said is what’s meant, no action means no action, eventually someone who wants to chat will come along. A friend sent me a link to an article about about modern dating. It mostly pertained to the Millennial Generation, but it still made me sad. while 20-somethings just continue in hook-up mode from college or group dates. A whole generation may never go on a proper date!! Its CRAZY!! It seems gone is the actual verbal asking for a date, most guys seem to text or email & usually without much notice, according to the article. I am SO thankful to not be a part of that generation! Especially since I’ve been “trying out” the older gentlemen, they have all picked up the phone & asked me out (only 1 resorted to text & he was weeded out quickly). I’m not a phone person, never have been, even in high school. I like to use it to make the plans, & we’ll chat in person, so I try to keep the conversations short & sweet. I will admit it is great to put a voice to the words you’ve been reading though. It helps the daydreams seem more real. It also brought up the FOMO theory. I’ll agree with my friend that it has always been around to some extent, but I feel the internet & online dating have made the Fear Of Missing Out more pronounced. It has hyper-sensitized the fear of settling, I mean there’s soooooo many options now, with each click an even better woman or man could be waiting, while you just skim over one who’s good, but not 110% good…. Which leads me to pondering the “mathematical” matching systems they use on these sites…I’ve been shopping my matches & of course they see if you click on their profile, so at what percentage of a match is he worth clicking on? 75%? 80%? Only 90% & above make the cut? I used to figure 85% & up was good, but then my clicks I was attracted to were getting few & far between, so I’ve lowered it to the 80% match tile, with high friend %’s too. I figure that’s in the “B” range, right? That’s a hopeful amount for connection, right? Ok, enough with the online! Time to join the real world! It was solo date night on Saturday & I had a blast! I hadn’t treated just myself out in quite a while, so it was a refreshing change. Now it wasn’t the intended plan for the evening, but all my friends were busy & I saw no point to my tickets going to waste. 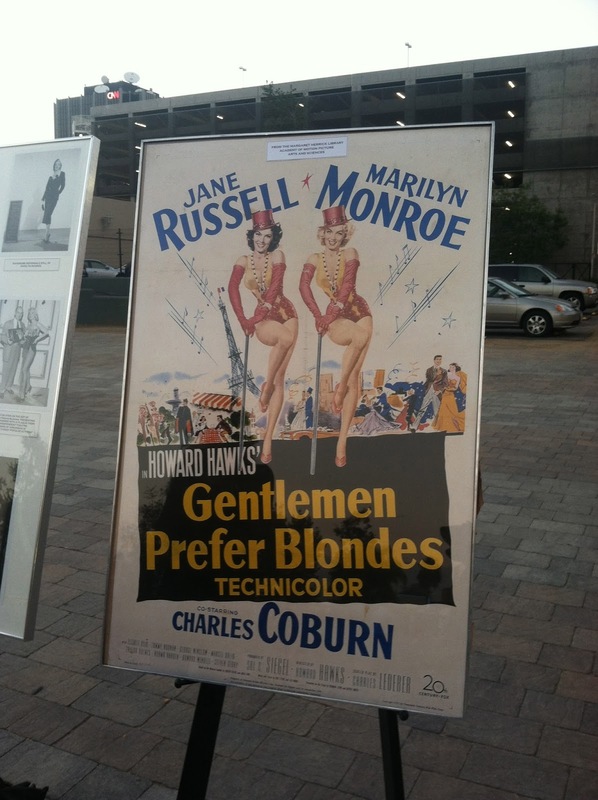 So I packed up my bag & off to the outdoor screening of “Gentlemen Prefer Blondes” I went. 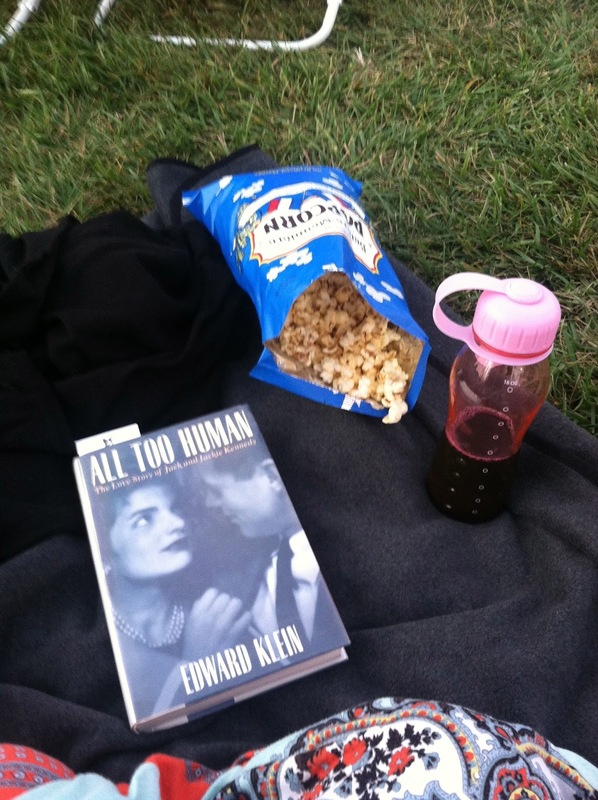 Had a good book to keep me company til the sun set, munched on my popcorn & drank my wine. It was divine. No awkward lulls in conversation. No worries if they were enjoying themselves. It was just me getting to soak up the gorgeous-ness of a crisp LA night, watching 2 wonderful actresses light up the screen. 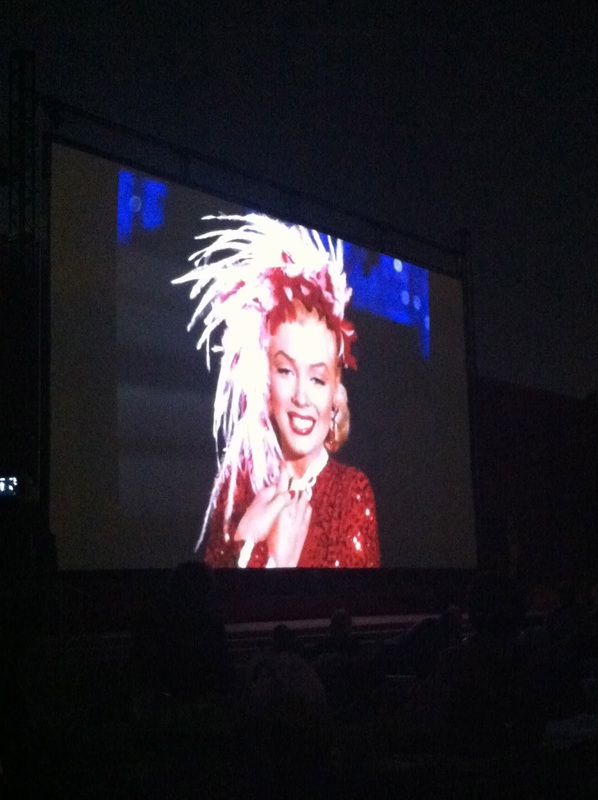 Its so fun to watch Marilyn Monroe oooooze her femininity. Sure, sometimes she uses to get what she wants, but there’s something so amazing in watching a woman own her beauty & curves. She was smart at playing dumb, you always know she knew what she was doing. So talented. We always fight so hard to be taken seriously today, but I’d much rather see strength from men than fight to be their equal. I love the men/women dynamics of the older movies! So, from solo dates, I jumped to well-crafted brunch with friends on Sunday for a “chance” meeting with a friend’s co-worker, who he thought would be a great match. Cute, very funny, same industry (which is a good & bad thing). Thankfully, I don’t think he was aware of the brunch’s intention. I know I don’t do well in groups, especially when most are strangers. I tend to be the quiet, listening one when surrounded by a large group of big boisterous personalities, like this one. It was hard not to “over-mimosa” to compensate, but thankfully I resisted the urge. I always appreciate my friend looking to hook a girl up! And, of course right on cue, enters the guy I was dating right before I met my ex – a previous hook up attempt from same friend’s…I shoulda figured he’d be there. Oops, sorry I never returned your calls or texts, I got busy being swept off my feet…so how’ve you been? Well that about sums up this past week, can’t wait to see what/who lies ahead this week! Is it the caffeine or you making my heart beat faster? Our introduction came through a very dear friend & she knows my penchant for nice guys, so it was a no-brainer. We already knew he was nice from im’s, texts, & brief phone calls (so many ways to communicate these days w/o ever meeting – crazy!! )…now came the actual face to face time!! I seemed to have passed the “starter communication” stages & he asked me if I’d like to grab coffee or lunch during the week? Soooo coffee or lunch turned into a phone call from me at 8:30p saying I was free, still interested? I had brought my cute dress to work, make up, heels ~ I was ready! Nope, brightly lit Starbucks it was. I know it may be wrong to judge on this life choice, but I have visions of long, romantic wine-tasting weekends away together and I want to SHARE the experience with my man, not have a designated driver! Starting to see how I over-think or analyze everything? I think I need to hit the “pause” button on my brain sometimes & just enjoy!! Did you know they close it at 9?.. Back inside we went til we got kicked out 9:30!!! Do we share similar interests? Or was it my macchiato jacking me up? Would I want to kiss him? Except I think for all the questions I was having, the actual answers truly laid in me trusting my intuition. Maybe I’m hiding behind excuses? 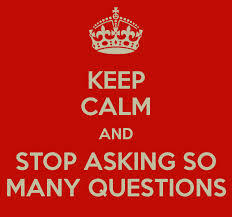 Of course I didn’t keep these questions to myself & asked for other’s advice on how they “knew”? I got a lot of “it took 6 or so dates, but he grew on me”, “1st meeting he disgusted me, 19 years later I couldn’t be happier”. Is it wrong to want to be excited for a 2nd date? To have giddy butterflies in your stomach? I’ve been studying lately about energies & what we put out to the Universe. Its pretty amazing what others can pick up even if you’re not aware of the exact message you’re sending. So, wouldn’t the 2nd date in theory already be a bust if you’re not excited about it? Can you fake the excitement in the “getting to know you” phase? 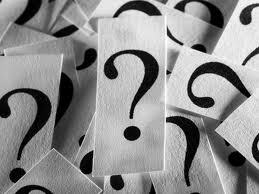 & I agreed – are you kidding, I needed answers! I think the BIGGEST answer came a couple of hours before our date. He texted to say hi, & set our plans. Now, I had gotten off work early (a fact I didn’t feel like sharing with him) & popped by a local outdoor mall to get some design inspiration. Turned out he was actually there too. I did an about-face & bolted to my car so fast it was not funny. Not a good sign, right? I’m sure you’ve probably gathered by now that the 2nd date didn’t see fireworks. I will say it was a perfectly lovely evening. He was gentlemanly, talkative, attentive. My inbox lately has been full of messages on “how to attract mr right”, “what makes guys choose you”, “find him before summer ends”…its a summer dating bonanza & they all entice you from your place of want, & punch you in your place of lack. I find with each one I open I’m questioning my greatness & who I am. I must FIX myself to achieve these desires. While their messages say “if love yourself & he’ll love you” (truly the best advice I’ve ever heard! 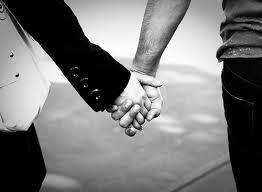 ), they also say you need to follow their steps to find success in love. Are you trying to change me? First up, speed dating tomorrow night!! Stay tuned, I’m sure there’ll be stories! !